We had a busy weekend I guess. On Saturday, we decided to do some family stuff, so we got up not-so-early, and drove to Raleigh. We started out at a huge used book store, and Justin finally decided he'd have to come back when he had lots of time. Then we grabbed some Chick-fil-a and headed downtown. We parked near the Capitol since we knew where the public lot was. I wanted to check out a little crafter's flea market, and I didn't quite realize it was as far away as it was. It was really only like 5 blocks west and 5 north, but to 3-year-old legs it seemed really far. It was a little disappointing because I thought they were going to have more stuff to craft with and fewer crafts. After that, we went to the Exploris which is sort of a hands-on museum for kids and then we saw Night at the Museum at the IMAX. That was pretty fun--I liked the movie. When we got back home it was time to go to some friends' house for supper. Thankfully Jonathan slept most of the way home. Sunday was Sunday, and you know how that goes. We've had a pretty loud house lately. 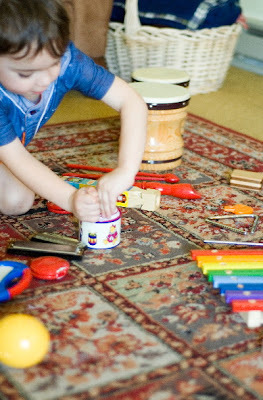 Jonathan has remembered that there is a whole bin full of instruments and noisemakers in the play room, so he's been trying them out. He really likes to play along with music on the computer. Today he just brought the whole spread into the den and went around playing one thing at a time. 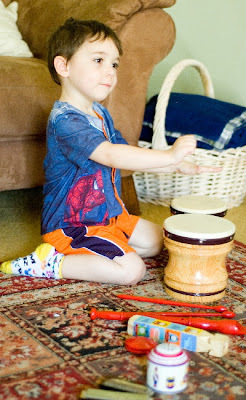 Sometimes he forgets which drums to use the sticks with and which ones to use hands with--what a delimma. I just have to keep track of where the tylenol is! Don't you love the socks? Also, it's hard to believe it's been 6 weeks today since we saw David. In some ways it seems like just yesterday, and in other ways it seems like years have passed. I really need to sit down and write out the whole story of that day while it's still in my mind. I hope to get that done this week, since we'll be gone on vacation next week. For now, here's a little something. I really enjoyed reading this post. I can relate to the tylenol. This post was a great read. There isn't a day that goes by that I don't think of you and your family. 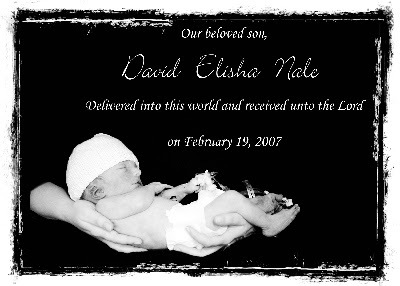 I love the saying on the picture of David. I got such goosebumps when I saw it. I find myself in the same time warp...some times it seems like it just happened...then other times like it was a lifetime ago. Jonathan is just so adorable. What a beautiful birth announcement. Praying for you and your family daily.